So, how close would the revised Atlantic Yards arena be from the street? 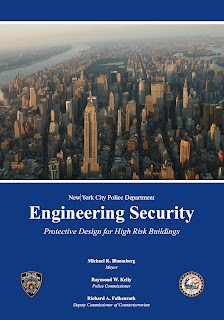 But these questions have grown in importance, especially because the New York Police Department (NYPD) on July 1 released a new guide to security for high-risk buildings, a category that likely includes the arena and could include the flagship officer tower (Building 1) still planned. As Alan Rosner, co-author of July 2005 White Paper (PDF) on terrorism and security issues regarding Atlantic Yards, commented, "They have done more with this single publication than the five-year community and local elected officials' effort to get the ESDC [Empire State Development Corporation] to take this issue seriously. The timing couldn't be better." Since news broke in October 2007 that streets around the Prudential Center in Newark would be closed (right) when major events are held, Atlantic Yards opponents and critics redoubled calls for a security study. 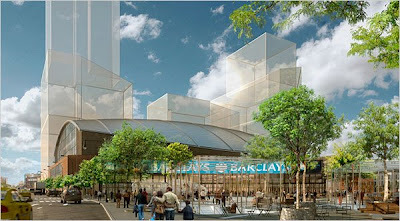 It took weeks to learn that the arena, at least under the previous Frank Gehry design, would be the same distance from the street as the facility in Newark. City and state officials have pledged that streets bordering the AY arena, notably busy Flatbush and Atlantic Avenues, would not be closed. The ESDC, in its environmental review, said that state law does not consider a terrorist incident a "reasonable worst-case scenario." Indeed, in a January 2008 ruling on that lawsuit, state Supreme Court Justice Joan Madden agreed that, while the argument that the ESDC should have considered the threat of terrorism "raises genuine issues of public concern," the law does not require that level of detail. Madden noted that the SEQRA (State Environmental Review Quality Act) regulations cite "facilities with some degree of dangerousness such as an oil supertanker port, a gas storage facility or a hazardous waste facility, and explicitly exclude 'shopping malls, residential subdivisions, or office facilities.' The instant Project is more akin to the latter category of excluded facilities." Well, yes, and no. The addition of an arena, and the history of a planned terrorist attack at the adjacent subway station--not mentioned in the decisions--add a layer of concern. And the new NYPD report ups the ante. Rosner observed, "The ESDC needs to authorize a Supplemental EIS [environmental impact statement] to address issues raised by constructing two high risk buildings next to an existing high risk transportation hub. Previous safety assurances offered by the developer from three years ago are no longer sufficient to warrant the modified project's automatic approval." However, the ESDC, in a Technical Memorandum issued last month to accompany a revision of the Modified General Project Plan (GPP), indicated that neither the proposed modifications nor a delay in the plan would result in "any significant adverse environmental impacts" not addressed in the Final EIS. Security and terrorism were not mentioned. The Modified GPP is set for a hearing July 29-30 and, presumably, approval by the ESDC board in early September. As a first step toward enhancing perimeter security, the NYPD recommends that owners of High Tier buildings conduct vehicle threat vector analyses and incorporate hard perimeters into their design plans. Rosner observed that the transit and Long Island Rail Road hub is high risk by definition, and the arena likely would be high risk too. The adjacent office tower, in combination with the glass Urban Room, along with linkage to the transit hub, would be at least medium risk and likely high risk under his interpretation of NYPD's scoring system. "That's a lot of concentrated Phase I associated risk," he commented. "The Modified GPP declares the approval is for an unchanged project and timeline. On that basis, the whole package requires the ESDC to take a hard look and accept authorizing a Supplemental EIS using an explosive event as a reasonable worse case scenario. That was not their position in '06, but now that six of the seven chapters in the [new security handbook] address just such scenarios, it's a much tougher position to justify." While FCR cited cost as the main factor in dropping Gehry for the firm Ellerbe Becket, veteran designers of sports facilities, cost may have been intertwined with both design and security. For one thing, Gehry's design was impossible, I'd contend, unless all four towers wrapping it could be completed roughly in sequence. Also, the New York Daily News reported that the high cost of safety glass had contributed to the astounding 50% increase in the announced price tag, from December 2006 to March 2008. As I point out below, veteran sports facility designers Ellerbe Becket have stressed the importance of having "wider restricted zones" to improve security. Either the new arena design has such zones, or other adjustments are being made. The NYPD on July 1 released a 100-page report, Engineering Security Protective Design for High Risk Building, to assist the New York City building community in preventing and mitigating the effects of a terrorist attack on a building. 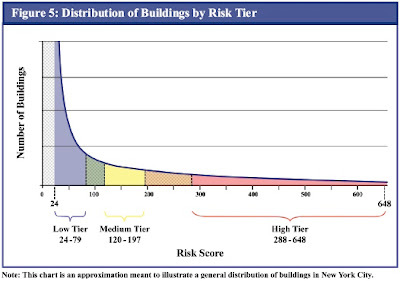 The study also creates a three-tier system designed to categorize buildings based on risk. Below, I go through the numbers, relying in part on Rosner's input, to suggest that the arena would likely qualify as high-risk under the NYPD scoring system. One key security issue for the arena, as exemplified in Newark, is the concept of "standoff"--the distance from the street. As the graphic below shows, a person or vehicle with 100 pounds of TNT--the middle line--could easily cause fatalities if it got within 20 feet of a building, and maybe even within 30 feet. Generally, owners of Medium and High Tier buildings should seek to maximize the amount of protected standoff surrounding a structure. However, available standoff in dense urban areas generally does not exceed the width of a sidewalk; moreover, this distance is only guaranteed if the building is protected with a hard anti-ram perimeter. In New York City, zoning resolutions setting street-to-wall requirements significantly limit the amount of standoff available to certain buildings. In such circumstances, the NYPD recommends that building owners consult with professionals about the possibility of applying for waivers, variances, or exemptions to allow appropriate protective design measures. When such exceptions are unavailable, or when protected standoff is insufficient, protective security design methods are crucial for achieving blast protection for key structural and facade elements. Should we expect "a hard anti-ram perimeter"? Design basis threat (DBT) is the magnitude of the blast from an explosive device that a building or particular building element should be designed to withstand at a specified distance. The magnitude of this threat is expressed in TNT-equivalent charge weight, and the distance in feet. For example, a building’s DBT may be stated as a 500-pound TNT-equivalent explosive charge at 20 feet of standoff, meaning the building, or the particular building element to which the DBT is assigned, must be able to withstand the loading associated with a 500-pound TNT-equivalent explosive charge, from 20 feet away. 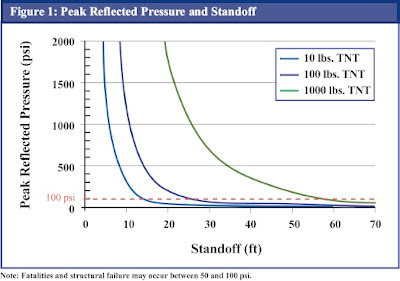 Increasing standoff and using building design techniques to harden structures may allow buildings and particular building elements to resist explosive threats that present abnormal loading. The load a specific building element must withstand varies with both the distance and magnitude of the threat from an explosive device. The distance component of DBT takes into account the most probable scenario: that attackers will get as close to their targets as possible. For this reason, the distance component of DBT tends to be no more than the standoff afforded the building or the particular building element under consideration. they are located so close to critical infrastructure that a successful attack would severely disrupt service. Appendix A explains how to determine a rating for each factor--threat, vulnerability, and impact--suggesting that a score of 1, 2, or 3 be assigned to each sub-factor. The language describing each rating comes directly from the report. Following is my AYR comment, in some cases developed after consultation with Rosner. 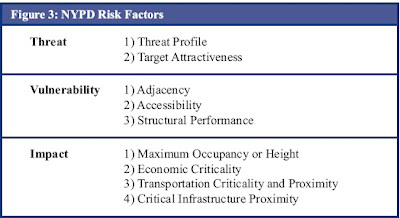 A building’s threat rating is the sum of the scores of two sub-factors: threat profile and target attractiveness. Because threat consists of only two sub-factors, the threat rating should be a total from 2 to 6. 2: Moderate – the building falls into a category that is the subject of a past or present general threat but is not and has not been the target of a credible specific threat. AYR: Given that the adjacent Atlantic Terminal station was the subject of a terror plot in 1997, this should be at least a 2. Without a direct threat, it's probably not a 3. 3: Significant – the building’s architectural design is nationally recognizable. AYR: Well, the Frank Gehry design would have been nationally famous. Even a more pedestrian design would be nationally recognizable because of significant publicity. A building’s vulnerability rating is the sum of the scores of three sub-factors: adjacency, accessibility, and structural performance. Because vulnerability consists of three sub-factors, the vulnerability rating should range from 3 to 9. Note that the ratings should be 1, 2, or 3, but in each of these cases I've split the difference, given the lack of information. 2: Moderate – the building has at least one High Tier building located less than 300 feet, but more than 150 feet from it. AYR: This is iffy, but there would be a flagship office tower next to it should Building 1 get built. That's closer than 150 feet, Building 1 may or may not qualify as High Tier. Then again, Rosner points out that the arena would be over the drill track that is crucial the railyard's operation. So, I'm splitting the difference. 2: Moderate – the movement of people in the building is controlled; or vehicles are screened or otherwise obstructed before approaching. If vehicles are able to enter the building (e.g., through an internal parking garage or, in a handful of cases, on a street that cuts through the building), vehicles are screened prior to entry. 3. Significant - the movement of people in the building is not controlled, or is controlled only to a limited degree, and vehicles are neither obstructed nor screened before approaching or entering. AYR: While there would be controlled movement and screened vehicles, Rosner notes that the arena would need permanent anti-vehicle barriers. Perhaps the arena has been redesigned to allow for such perimeters. Again, I'm splitting the difference. 2. Moderate - for threats from the true perimeter, the building's primary structural elements satisfy M3 standards; or for threats from a contact charge, the building’s columns satisfy M1 standards. 3. Significant - for threats from the true perimeter, the building's primary structural elements do not satisfy M3 standards; and for threats from a contact charge, the building's columns do not satisfy M1 standards. AYR: Rosner suggests that, if there's the zero protection at the arena's "true perimeter," the building's columns should be required to meet M3 standards, because the structure of the building itself that becomes the true perimeter. Again, I'm splitting the difference. A building’s impact rating is the sum of the scores of four sub-factors: maximum occupancy or height, economic criticality, transportation criticality and proximity, and critical infrastructure proximity. Because impact consists of four sub-factors, the impact rating should range from 4 to 12. 3: Significant – the building has a maximum occupancy level of more than 10,000 people or is taller than 800 feet. AYR: The arena would hold 18,000 people for basketball, more for concerts. 2: Moderate – a successful attack on the building could considerably impact the local or regional economy, or affect the national economy in the immediate aftermath of the attack (total economic losses ranging from $1 billion to $10 billion). AYR: This is an estimate, of course, but an attack on the arena could affect the adjacent Atlantic Terminal station and thus have ripple effects. 3: Significant – the building sits atop five or more sets of transit lines, or is located adjacent to the footprint of a transportation hub or transfer point servicing as many lines; or, the building sits atop a vehicular tunnel or is adjacent to the entrance to a bridge. AYR: The building would be adjacent to the Atlantic Terminal transportation hub. 3: Significant – the building is located so close to critical infrastructure that a successful attack against the building would severely disrupt service beyond the building itself. AYR: Yes, the station could be compromised, notably because of the drill track under the arena. To determine the final risk score, the impact, vulnerability, and threat ratings are multiplied. So, 5 x 7.5 x 11 = 412.5, which is well within the High Tier, which starts at 288. Even if we didn't split the difference and calculated scores of 2 for the three sub-factors under Vulnerability, the sum of 5 x 6 x 11 = 330, still well within the High Tier. Indeed, whatever the number, I suspect that any large sports facility, given the size of the crowds, must be considered High Tier. Seating bowls in stadiums and arenas present unique blast mitigation challenges because the pressure of a blast can cause seats to dislodge, leading to blunt injuries or death. Accordingly, the NYPD recommends that owners of major stadiums and arenas install primary structural elements and seating tie-down elements that achieve DBT levels in the M3 range from the true perimeter. The NYPD recommends that stadium and arena owners consult with blast engineers and the NYPD Counterterrorism Bureau to determine site-specific DBT standards within the M3 range. The determination is based on analysis of expected casualty levels given variations in occupancy, charge weight, standoff, geometry, and structural hardening. Windows present the most difficult challenge for building owners attempting to mitigate the hazards associated with debris impact, because glass is brittle and inflexible, making it particularly susceptible to failure. The designer of the Atlantic Yards arena, in discussion post-9/11 design of sports facilities, counted having a secure perimeter--a challenging task given the AY arena site--as a crucial component of security. In Brooklyn, however, Ellerbe Becket didn't help the developer choose the site--it's helping mop up. 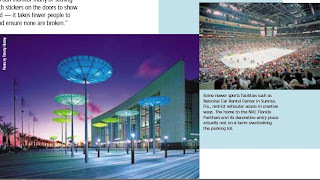 The Spring 2002 issue of the Ellerbe Becket Quarterly magazine included an article headlined No Weak Links: Designing secure sports facilities has renewed focus. Restricting how close vehicles unrelated to operations can get to a sports facility also is important, but not always easily addressed. “Many facility owners use concrete barriers or fences to increase the auto perimeter around stadiums and arenas during events to prevent incidents such as car bombings,” says [architect Gordon] Wood. “The distance allowed varies since streets tightly border many facilities in urban settings.” Outside the United States, roads surrounding a venue often are shut down on event day. “This creates a safety zone but also impedes traffic flow which can inconvenience fans and nearby residents,” says [architect Jim] Pieper. The safety emphasis, the authors acknowledge, must be balanced against fan inconvenience and labor costs. Wood and Pieper predict security will involve greater consideration given to site selection to allow for wider restricted zones around the facility. Both expect designs with out-of-reach air vents, increased use of and more space allotted to metal-detectors, technical advances in surveillance equipment and larger entry plazas that improve traffic flow for a smoother multipoint check-in process. “Our goal is to create designs and security systems that not only protect lives but also preserve sports facilities as entertainment destinations,” says Wood. One example, at right, is the National Car Rental Center in Sunrise, FL, home of the NHL Panthers (headed by Michael Yormark, twin brother Nets CEO Brett Yormark). The caption says that the facility "restricts vehicular access in creative ways," given that the arena and its plaza "actually rest on a berm overlooking the parking lot." That wouldn't be possible in Brooklyn. In 2002, Ellerbe Becket answered questions regarding The AT&T Center in San Antonio (formerly the SBC Center) in a piece titled SBC Center: Design Q & A.
Q. In the wake of September 11, were any special security concerns raised? A. We’ve had a year since September 11 to evaluate the implications and the bottom line is that there have been a number of relatively subtle issues addressed in the architecture and operations strategy. For example, you’ll notice metal detectors in use. We have the benefit of a very large site with lots of area and a generous public plaza space with shaded areas to que patrons in comfort. We think we’ve taken positive steps to deal with very real security issues and we’ve been able to integrate the additional security measures architecturally so that most patrons won’t even know they are in place. So Brooklyn, at the least, must be a challenge.